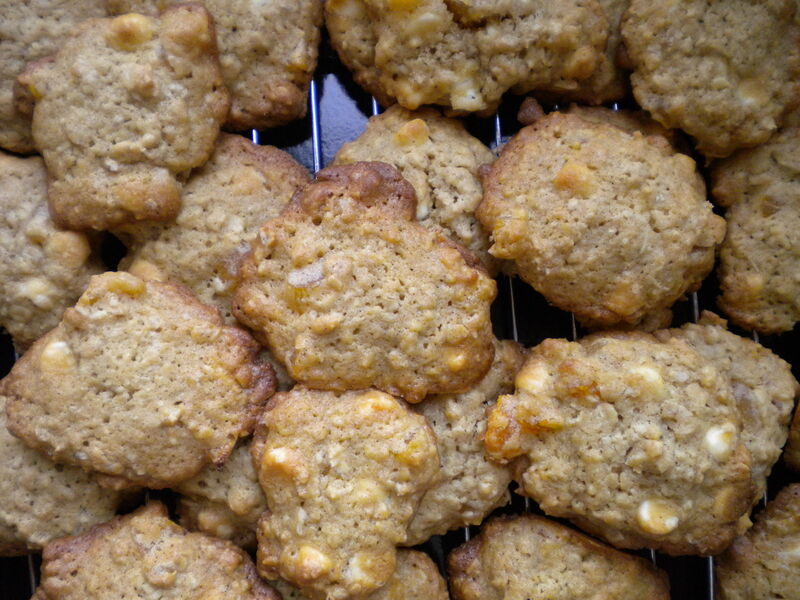 Oatmeal, Apricot and White Chocolate Chip Cookies – Voila! Bring these to your next spring picnic and people will love you. Apricot and white chocolate chips? Believe it, friends, they are two peas in a pod. Since I posted on apricot scones, many people suggested combining apricots with dried cranberries. I will definitely do that next time, but for now, I suggest everyone enjoy the simple pleasures of these delicious goodies. 1. Mix flour, oatmeal, and baking soda in a medium bowl. 2. Cream butter and sugars with a mixer until light and fluffy. Reduce speed to low. Add salt, vanilla, and eggs, and beat until well combined, about 1 minute. 3. Add flour mixture gradually, beating until just combined. 4. Fold in chocolate and apricots. Cover, and refrigerate until cold, about 30 minutes. 5. Drop heaping tablespoons of dough onto baking sheets, spacing 2 inches apart. Bake 12-13 minutes until cookies are golden brown around the edges but still soft in the center. Remove from oven and let cookies cool on baking sheets for 2 minutes before transferring to a wire rack; let cool. Cookies will keep, covered, for up to 1 week.